This review of the best baby moccasins will give you a detailed look on what you can choose for your child. While they might not seem like much, having a good pair of moccasins will help ensure that your baby’s feet are safe against splinters or stones, hot or cold surfaces. You can let a baby that has just learned how to walk go around barefoot or with socks with grips, but this depends on the flooring and how babyproof the house is. So moccasins are the safest choice! These BirdRock Baby moccasins were created by two dads to offer all the best features for babies and great value for parents. They feature soft flexible soles, are made of breathable leather and have an elastic band that keeps them securely in place. You also get to choose the pair(s) you most like as these moccasins come in over 20+ colors and style options and are available in six sizes (from newborn to 4 years old). They have soft, flexible soles. These shoes are made of high-quality, genuine, breathable leather. BirdRock Baby offers a 100% Lifetime Guarantee for them. The shoes don’t have anti-skid soles so they might be a bit slippery. The Robeez Kids’ Soft Soles Slip-on Moccasins are flexible, breathable, and made from 100% leather. These moccasins are available in four size options and a variety of cute, whimsical, but somewhat more feminine designs. Made of high-quality materials (including leather) for added durability, flexibility, and comfort. They are approved by the American Podiatric Medical Association. Have an elasticized ankle design that ensures they stay on. Several customers reported that the size of these moccasins runs large. While this can be great as the child could grow into them, it might also make them trip and potentially get hurt. 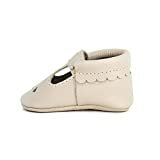 The aGu GuGu Soft Sole 100% Real Leather Baby Moccasins have breathable leather uppers, soft non-skid suede soles, and an elastic ankle band. With the added bonus of being made of soft, real leather, these moccasins definitely belong on this list of best baby moccasins. Their breathable leather upper also make sure that your child’s feet will remain dry and cool. They are available in two sizes and four designs and come in a gift bag which includes Matching Anti-slip Socks. Several reviewers praised how their fit and design. They have breathable leather uppers and non-skid suede soles. They come with matching non-skid socks. Might run a bit large, even in their smallest size. One customer thought they were a little flimsy. The Hanna Andersson Fringe Baby Moccasins are soft, flexible, and made of breathable leather. Their elegant design is perfect for both boys and girls and includes a delicate cut-out completed by an elastic top so they won’t fall off. These moccasins are available in four styles and different sizes and have leather soles. They are cozy, comfortable, and soft. These shoes and their soles are made of 100% breathable leather. Have an elegant, Swedish-inspired, fringe-completed design. Might be a bit difficult to clean once they get dirty. 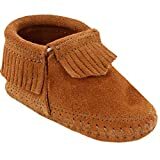 You can be sure that these Liv & Leo Soft Sole Fringe Suede Moccasins will not slip off your baby’s feet as they come with either a Velcro strap or an elastic to keep them in place. They have a soft suede sole for crawlers for sizes 0-6 months and 6-12 months, and a split suede/rubber sole for first walkers in sizes 12-18 months and 18-24 months. Their snug fit should also help prevent stumbles, so they should be safe to use even as you put your baby in an exersaucer. They have a suede sole for crawlers and a split suede/rubber sole for first walkers. These are soft and flexible shoes made from breathable suede. The sizing might be a bit odd, as several reviewers complained about them being too big while others claimed they were too small. Minnetonka couldn’t miss from this list of best baby moccasins, especially not the Riley Bootie. The signature Mini-tonka is specially made for the smallest of feet, so they are soft and flexible but still stylish. These shoes are made with breathable suede uppers and suede soft soles and, as expected, come with an elastic band that keeps them securely in place. They are available in five+ colors and 10 sizes and can be worn inside as well as outside. These baby moccasins have breathable suede uppers and flexible leather soles. Users say that are easy to put on and take off. They might wear down a bit too quickly (the seams especially). The result is a pair of durable but still soft pair of moccasins made out of breathable, wear-tested leather. They are available in 5+colors and 10 sizes. They are made of durable, breathable, and wear-tested leather. The elastic band will keep them in place but also make them easy to take off and put on. Great choice for infants and toddlers. Some reviewers warned that there may be counterfeits versions. You’ve just found the perfect pair if your child needs the best baby moccasins that can be used both indoors and on the playground. The Augusta Baby Soft Sole Moccasins are also very safe as they are not made with Polyurethane (PU) leather or any materials that might contain traces of lead. Instead, they are made of top grade certified leather uppers and non-slip soft suede soles and have elastic bands that keep them secure. This model is available in 15+ cute designs and 10 sizes. They are very versatile as they can be used both indoors and outdoors. Have leather and rubber Gommino soles. Their design mimics the adult version of moccasins but adds a childhood charm to them. These shoes might be a bit hard to put on. UGG Kids’ Solvi fashion boots are made in Australia and use dyed merino sheep fur for the uppers and lining and suede for the soles. Their hidden elastic gores keep them securely in place and also make them easy to put on or pull off. They have a buckle closure. With their sheepskin lining, these moccasins will be the warmest and best baby moccasins for cold weather. These are soft and comfy shoes. Their lining and materials might make them too hot to wear in the summer or warmer months. These Umi Bevin Baby Moccasins come equipped with rubber soles specially made for first-time walkers. As it’s to be expected, they have an unrestrictive design, are lightweight and flexible, and are made from breathable leather, are lightweight. They are available in four colors and eight sizes. These shoes have cushioned leather footbeds. Stylish, fun, and playful design. Their fit should be true to size. One customer complained about scuffing after a few weeks, and another complained about holes after only a few uses. Ready to Put On some New Shoes? 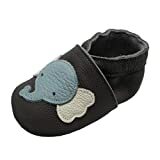 Since all of these pairs are among the best baby moccasins you can find nowadays, it’s up to you to decide which one will best fit your child. Still, to try and make things even easier, besides the list, take a look at the following facts as well, they might just make it more simple to choose. A baby’s shoes should be breathable, flexible, and have leather or rubber soles with good traction. They should also be padded around the ankles, on the back of the heels, and on the bottom. Having flexible shoes will enable the proper development of the baby’s muscles and help the soft bones in the feet grow properly up to five years old. TIP: A proper fit means having enough room to insert a little finger in the heel area and a thumb space between the baby’s toes and the toe of the shoe. Since babies grow so quickly, the fit should be checked monthly. If you have any comments or questions about these moccasins or want to point out a pair we didn’t mention, feel free to use the comments section! Hi! I noticed our Monogrammed Moccasins were not included in your list! I’d love for you to check us out- http://www.kinsleycollection.com. We have a large selection of custom made monogrammed moccasins for babies! We have a very strict policy on picking products from Amazon – they need to have at least 10 reviews and an overall rating of over 3.5 stars, and after that, we need to like the product in order to feature it. If you’d like, we could talk about making an honest-to-goodness review of one of your products. If you’re interested, contact us at social@momcrib.com.